Lectins are proteins / glycoproteins of non-immunological origin found ubiquitously in all organisms. Research investigations show that many types of diseased tissues often display glycans that vary from their normal counterparts. Therefore, lectins that can interact with these transformed glycans may be used for early diagnosis and treatment of diseases. Specificity of lectins towards glycans has greatly attracted nanobiotechnology in engineering lectin functionalized nanoparticles. Conjugating lectin with a nanosystem can identify and specifically attach to the carbohydrate moieties of glycoproteins expressed on cell surfaces and this has led to the development of several lectin functionalized nanoparticles to target drugs to various tissues with minimized systemic side effects. Such efficient lectin functionalized nanoparticles developed so far, and their role in targeted drug delivery, targeted therapies and oral immunization are reviewed. Technical difficulties behind designing and targeting these lectin functionalized nanoparticles are also discussed. Keywords: Drug delivery, glycoprotein, immunization, nanocrystals, nanoparticles, photodynamic therapy. 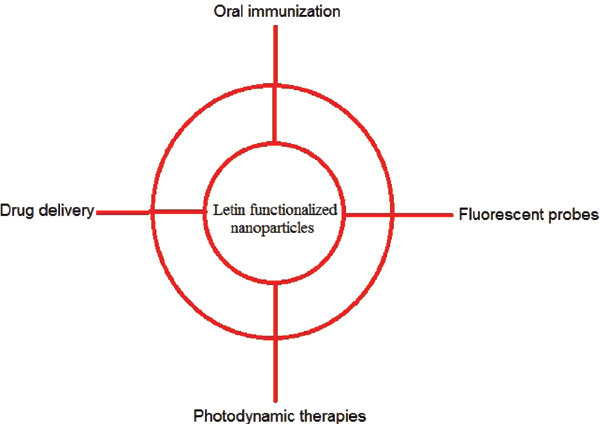 Keywords:Drug delivery, glycoprotein, immunization, nanocrystals, nanoparticles, photodynamic therapy. Abstract:Lectins are proteins / glycoproteins of non-immunological origin found ubiquitously in all organisms. Research investigations show that many types of diseased tissues often display glycans that vary from their normal counterparts. Therefore, lectins that can interact with these transformed glycans may be used for early diagnosis and treatment of diseases. Specificity of lectins towards glycans has greatly attracted nanobiotechnology in engineering lectin functionalized nanoparticles. Conjugating lectin with a nanosystem can identify and specifically attach to the carbohydrate moieties of glycoproteins expressed on cell surfaces and this has led to the development of several lectin functionalized nanoparticles to target drugs to various tissues with minimized systemic side effects. Such efficient lectin functionalized nanoparticles developed so far, and their role in targeted drug delivery, targeted therapies and oral immunization are reviewed. Technical difficulties behind designing and targeting these lectin functionalized nanoparticles are also discussed.